Opponents of the Starwood Knoll multifamily development erupt in cheers after the Livingston Parish Council rejected a preliminary plat on a 5-4 vote at the Jan. 10 meeting. Walker resident Dee Dra Sellers fears traffic congestion could worsen with the construction of the Starwood Knoll multifamily development. 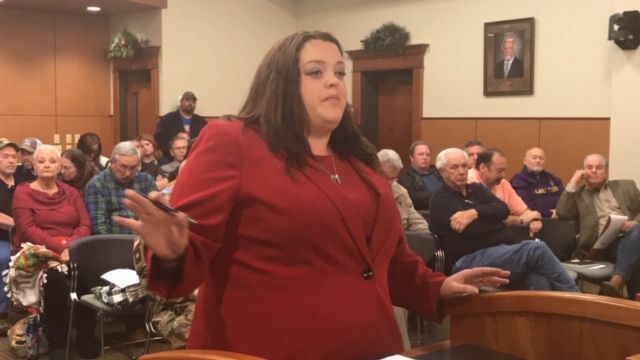 She and other constituents voiced their opposition during the Jan. 10 Livingston Parish Council meeting. Billy Taylor of McLin-Taylor Engineering, speaking on behalf of Garry Lewis Properties, discusses concessions Lewis offered the Livingston Parish Council to move forward on construction of the Starwood Knoll multifamily development. LIVINGSTON – The Livingston Parish Council rejected a preliminary plat for a multifamily development in a subdivision adjacent to a rapidly growing residential corridor. The 5-4 vote at the Jan. 10 meeting before a capacity crowd followed more than an hour of often-heated protests from opponents of Starwood Knoll. The proposed development would be located adjacent to Woodland Crossing, a subdivision which fronts Bonnie Blue Drive. Starwood Knoll Development, proposed by Garry Lewis Properties, would occupy 10 acres of a 75-acre tract 200 yards from La. 447 in Walker off the south side of Interstate 12. Council members Jeff Averett, Tracy Girlinghouse, R.C. “Bubba” Harris, Shane Mack and John Wascom voted against the plan. Councilmen Jeff Ard, Maurice “Scooter” Keen, Tab Lobell and Garry “Frog” Talbert approved the measure. The vote against the plat drew a loud cheer from the crowd, most of whom opposed the development. The council’s decision came one night after the Livingston Parish Planning Commission gave the green light to the plan. Concerns that the complex would put additional strain to infrastructure and create more congestion along roadways – particularly nearby Buddy Ellis Road – fueled the protests from residents. Road issues already pose a problem, resident Dee Dra Sellers said. She said her husband, a disabled veteran of the U.S. Marines, fell off a tricycle when he hit a pothole on Buddy Ellis Road. Resident Jennifer Hossink asked how long the parish will continue to allow development of complexes. She said another complex on Buddy Ellis has stayed far under residential capacity, which has forced the proprietors to lower the rent. The Parish Council cannot dictate what should be considered “enough,” District 2 Councilman Garry “Frog” Talbert said. Project engineer Billy Taylor of McLin-Taylor, Inc., spoke on behalf of Lewis, who made concessions to move forward on the development. Taylor said Lewis has offered to develop a construction entrance on La. 447 to ease some of the traffic strain on the side roads. He also offered to perform additional drainage and traffic studies and build a park in the area for both the tenants and residents in the adjacent subdivision. The parish ordinances require developers to meet building specifications, as well as conduct traffic and drainage studies. The ordinances do not mandate where a single- or multi-family dwelling can locate, nor can it legislate location of a building zoned as residential or commercial, Parish Attorney Chris Moody said after the meeting. Restriction on properties without lack of zoning could also open the parish council or individual members to a lawsuit, he said. The lack of zoning leaves little or no ability for restrictions, Girlinghouse said. The council must eventually resolve to make another push for zoning if residents want restrictions to growth, even though he realizes it may not work in all parts of the parish. “I, too, remember when Walker was one lane, and sometimes I long for those days, but the growth in the Walker area and Denham Springs and Watson has exceeded the capacity of the infrastructure,” he said. “That’s a hard truth, but it’s the truth. Zoning would be a hard sell, Keen said, but the council must eventually make the push.